As a frequent visitor to the Weather Center, you may get tired of the same background images. Well, if you want to submit a custom Background Image for the Weather Center, now you can. You must comply with the requirements below in order for you image to be considered for approval. All backgrounds must be approved and any image can be rejected for any reason. All the Weather Center Backgrounds are centered and aligned to the bottom of browser window. For those familiar with HTML, the background CSS is 'fixed bottom center'. The background will repeat if browser client window is bigger than image size. To assist with creating a background, a background template was created. The template can function as a base to start from, or can be imported as a layer in your photo editor to help with your background layout. The template shows the content area and focus area shaded. Hover your mouse here to see the template overlaid on sample background above. You can download the template here (the download is packaged as a .zip file and contains a single .png image). Use the background template as a base (or layer) to guide you with layout. Focus and maybe scale your content in the focus areas shown in the template (shaded green) to accommodate varying browsers & screen heights and widths. The 'content area' of the Weather Center is 1031 pixels wide and is centered (shaded red in template). 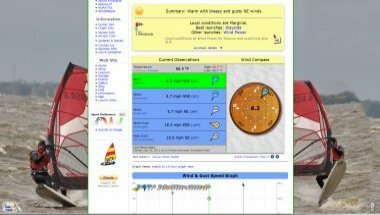 The background behind the Weather Center content is only visible when a visitor hovers their mouse over the Wind Power Logo in lower-left of page for a few seconds. If you are 'composing' your own image, consider feathering the images to soften the blend lines between images. Or hide any 'seams' behind the center content area. Study the existing backgrounds a bit and experiment with it. If you have an image you want to submit or have a question on submitting one, please Contact Us to send an e-mail to Wind Power. Wind Power will contact you with an e-mail address to send your image or respond to your inquiry. Images are submitted via e-mail (not upload) and subject to review by Wind Power Surf Shop.